There is no doubt that girls dominate over boys in the ballet world today. This was not the case back when ballet shifted from stately court appearances to professional performances on stage. Back in the 1660’s it was males who emerged as the first professional ballet dancers. In the Renaissance era, only male dancers would perform, using masks for when they play female roles. By the end of the 17th century women began to appear on the professional stage. However, it was only during the Romantic period of ballet, 1830 to 1870, that male dancing started to lose its supremacy to the female dancer. Today the demands of a male dancer is strength, grace, agility, musicality, discipline, technical prowess as well as beautiful partnering ability. Thousands of boys take up ballet each year to train and develop these qualities and strengths in this career. A career that is deemed to be one of the most physically demanding jobs there is. Yes, more difficult than fitness trainers, structural iron and steel workers, and forest fire fighters! Google it. At the Foundation, even though the girl to boy ratio is staggeringly high, our boys who dance do not disappoint. Ranging from ages 6 – 38, our ballet boys are hardworking and enthusiastic about dancing, and do not shy away when it comes to performing challenging and physically demanding movements. Here is a little insight into some of our ballet boys. Our youngest boy here at TLFCB is Hrishi who is 6 years old. He started ballet at age 3 in Bristol, UK. 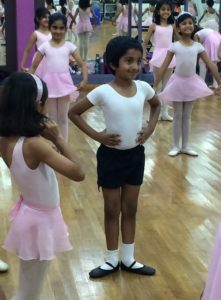 Now at age 6, this enthusiastic, happy little dancer attends classes at our Jayanagar studio. Being the only boy he says he wishes to have more boys for company, but still enjoys coming to class every week. A football fan and swimmer, Hrishi loves ballet and dancing just as much as all the little ballerinas in his class. A dancer, yogi and hockey player, Vivaan has been dancing with us for almost 7 years now. At age 11, his favourite thing about ballet is that he can sweat it out and work out in a fun and artistic environment. He finds being flexible and pointing his toes as much as the teachers want him to the hardest. Even though his legs might hurt a lot after class, jumping and just being able to move to the music makes it all worth it to him. Vivaan has been part of many of TLFCB’s productions, the latest being as a part of the cleaning of the castle scene in Belle and the Beast in 2017. His other interests lie in hockey, football and swimming. Now 14 years old, Tejas started dancing with TLFCB at the age of 6 as one of the children that was a part of our outreach programme at the Parikrma Foundation. Since then Tejas has bloomed as a dancer and is on an upward incline with his practice, and is part of our dance company National Youth Ballet. His favourite part of ballet is being trained under our Artistic Director, Yana Lewis. He enjoys jumps and allergo work the most in class. Though often stressed and burdened with school work and other priorities, it all fades away when he is in the studio dancing. Tejas has danced in many of our productions over the years. His favourite was Belle and the Beast as he had the opportunity to take up multiple roles. With great footwork and ballonne, and a passion for dancing, we are sure he will go far in the world of dance. 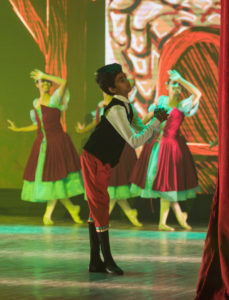 A member of our National Youth Ballet, Suresh also started dancing as part of our outreach programme. 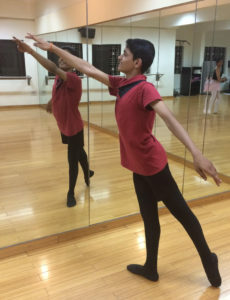 He dances 3 times a week, and is preparing to take his first ballet examination this year. Suresh is an excellent jumper, and shows great promise despite his petite size. He has already played two main roles in our shows, and has traveled with senior dancers to perform in New Delhi. Fun loving, hard working and very talented dancer – words that describe Peter Mani. His raw energy and artistic presence in performance can be felt by the audience and his jumps are captivating. Peter started dancing in 2007 through our outreach programme, and has been part of the TLFCB family ever since, despite taking a couple of breaks from dancing. Now at age 23, his focus and dedication shines through as he prepares for this year’s ballet examinations. He has played the lead role in our production Belle and the Beast in 2017 and the Tin Man in Oz the Ballet in 2015. Peter has also performed in numerous solos, pas de deux as well as company choreographies across the country. He enjoys dancing and wishes more of the male population could join and train in this art form. At age 38, Sagar is the oldest male dancer in the Foundation, but he doesn’t allow age to dim his passion and zeal for ballet. He started ballet about a year and a half ago and had the chance to play the role of Maurice, Belle’s father in Belle and the Beast last year. To perform on stage was a life changing moment for him. He also enjoys the life lessons he can derive from what he learns in ballet. Such as the fruits of being consistent and working hard and on being present in the moment. Ballet, to Sagar, is a great stress buster at the end of a hard week of work. Two of our long term ballet boys are presently pursuing a higher education in dance overseas! 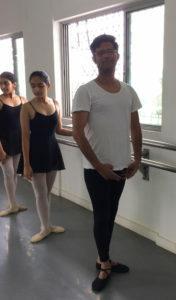 Rahul is in his second year of his degree in ballet from Ballet West, Scotland. Anand has just begun in the first year of his diploma is dance at the Contemporary Dance School, Hamburg. We encourage our male audiences and readers to test the waters and see what it is like to become a ballet dancer. We have so many inspiring dancers both here at TLFCB and around the world to lead the way! What are you waiting for? Interested in joining ballet classes? Click on this link to register. What is stopping you today from starting the journey of dance? Comment your views in the section below. I want to know more about you dancing classes .